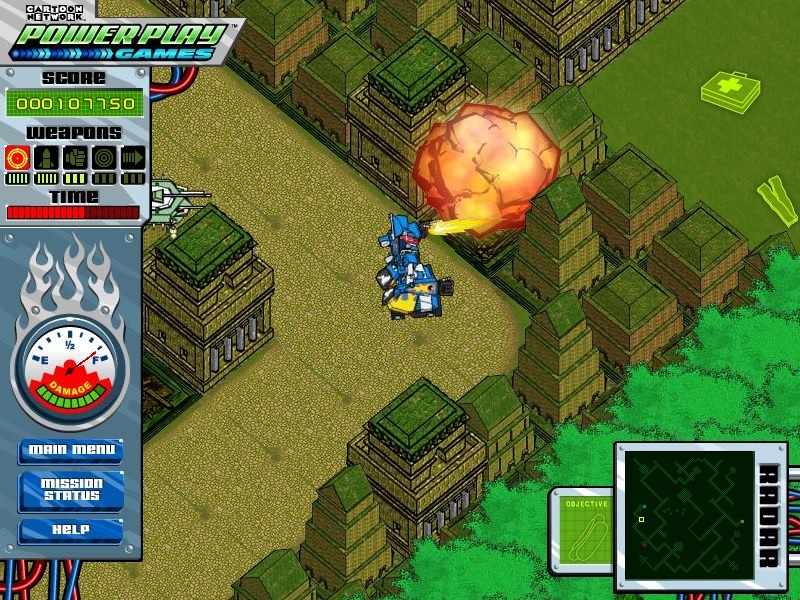 Have you ever heard of the TV show Megas XLR from the Cartoon Network? Did you know the video game was once part of the free Cartoon Network games? The reason I say it was is because it is not anymore. 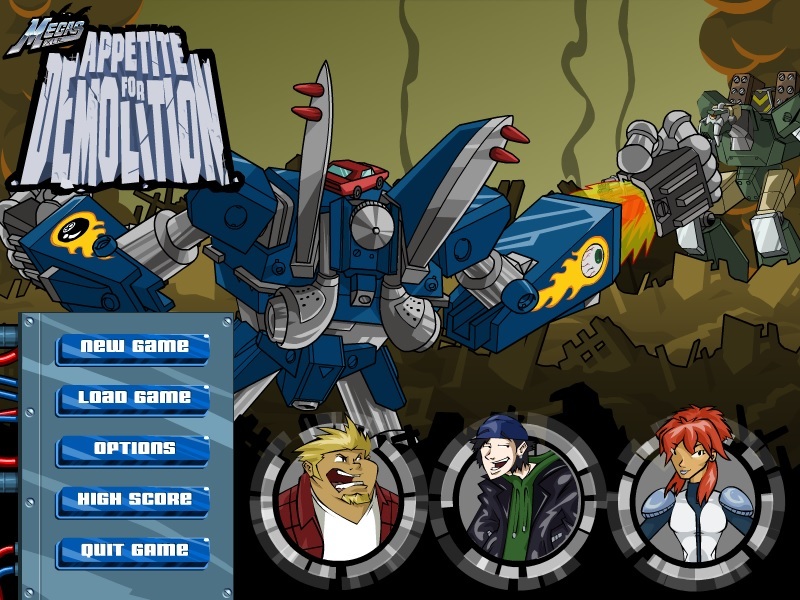 A video game company, Skyworks Interactive, Inc. that I used to work for made the game for the Cartoon Network Power Play Games website back in 2004 and it was called, Megas XLR: Appetite For Demolition. The game contained 4 different levels, each with 3 sub-levels that you had to search for hidden items while controlling Megas and fighting the Glorft robots. 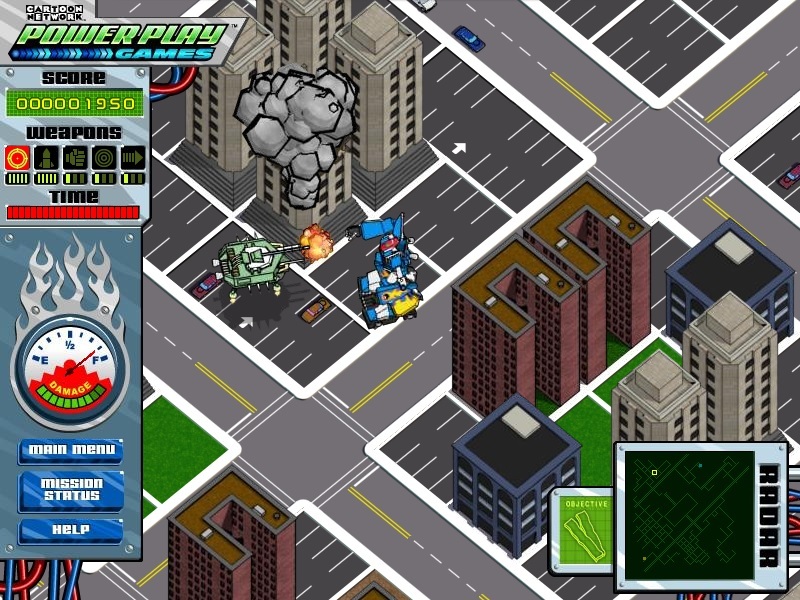 You could demolish buildings and other structures, crush cars, and walk over the rubble. You had 5 types of weapons. Cannon fire from one of Megas’ arms which were unlimited and 4 other weapon upgrades. You had radar to help you find your objectives. You had to also find batteries to keep Megas from losing power and first aid kits to repair the damage that Megas took on. Plus you were also working against a timer that was counting down. The sound effects were great and you would hear each of the three characters of the show (Coop, Kiva and Jamie) saying various lines throughout the game. You would also hear the main villain Gorrath either yelling at his robot forces to stop Megas or taunting the trio as they move about searching for hidden items. 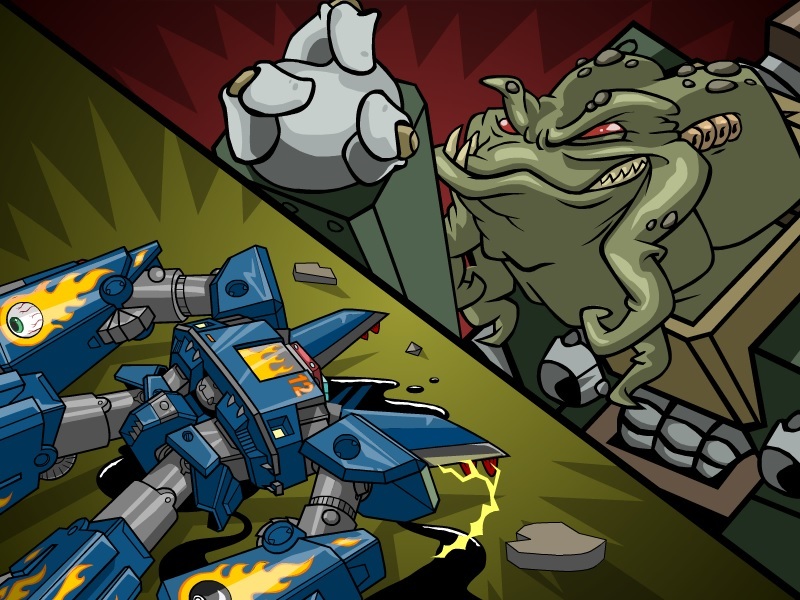 The game would end if you became fully out of power, were totally destroyed by the Glorft robots and/or ran out of time. 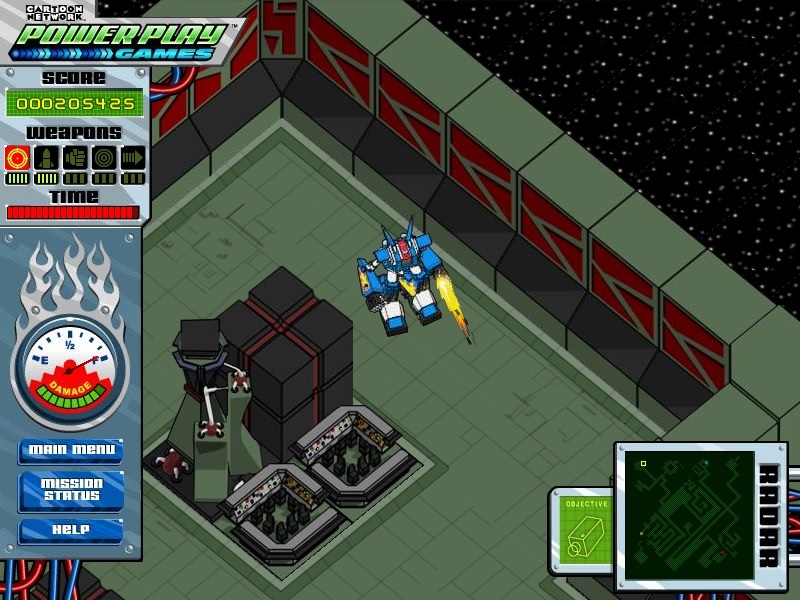 The game would only proceed to the next level if you successfully completed all objectives within each sub-level. I was one of 4 testers that got to design one of the 4 levels. My level was Level 1. This is the picture that looks like a city scene. Level 2 is the picture with Megas among the trees and Level 3 shows Megas on a space ship surrounded by stars. As soon as I can beat Level 3, I’ll post the pictures of Level 4 and the end of the game. It may take a while. Before today I haven’t played this game in 8 years. I liked how the game came out so much that I saved a copy of the entire game on the computer I designed the levels on. 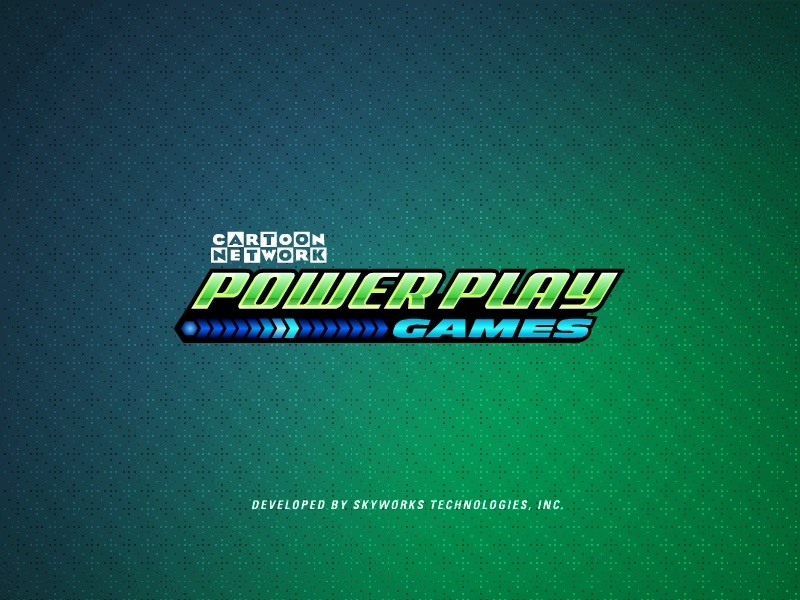 I’m glad I did because I believe that once the show was cancelled the game was pulled off of the Power Play Games website. I have looked and cannot find it anywhere online. If you are a fan of the show I hope you enjoy the pictures. Maybe one day the game will be re-released. Until then I guess I’ll be the only one playing this completed game. If you are a fan of the show or you are an ex-coworker of mine, I would love to read your comments below. Please leave them and I will get back to you. Thanks! I may actually have a standalone non-browser version. I’ll have to look. I, also, was very proud of this game. We had certain limitations with Flash, but that not withstanding, I was very happy with the way it turned out. Ha. I remember the “Coop de Gras” line. It’s funny. When I write a script, I work so hard to get into the minds of the characters that the lines practically write themselves. I guess it’s like method acting. And when i read my scripts years later, at first, it seems like someone else wrote it. I don’t even recognize my own work. When i wrote that script, I watched all of the episodes that Cartoon Network sent over, at least twice. When i handed in the script, it was enough to fill an entire 30 minute episode. I thought for sure that Cartoon Network would read this gem and hire me on the spot to write an episode. They told me to cut 20 minutes. Still, and I just told my game design class this, it’s probably the work I’m most proud of, at least from Skyworks. Designing and writing Casper for Morning Star Multimedia is up there, though. I remember Casper! – Casper on the SNES or PC or both? When it came time to record the script, the 3 main voice actors from the series were on board (I think it was in their contract), but there was a problem getting Clancy Brown, the voice of the Glorfft Commander (and one of my favorite actors of all time). You would know Clancy Brown if you saw him. He’s also the voice of Lex Luthor in Justice League, and Mr. Krabbs from Spongebob. Anyway, as I remember it, it was in his contract that he doesn’t have to do voice overs for video games, commercials, etc. In fact, if you listen closely to any Spongebob video game, you’ll realize that it’s not the real Mr. Krabb’s voice. But it must have been important to Cartoon Network to have him in the game, because they paid him extra money to do it. Then I heard that all the other actors got paid the same amount because it was in their contracts that they all get equal pay. That game must have cost a fortune! Probably why Cartoon Network canceled the show after a little more than a year. So it was a download game. OK that explains why I was able to keep a master copy of the game on my flash drive. I remember saving the game shortly before we released to Cartoon Network because I had designed the first 3 levels. Sean did levels 4,5 & 6. Silas did 7.8 & 9 and Lohan did 10, 11 & 12. I tried contacting Skyworks but got no response from there, so I’d be extremely happy if you could tell me how I can obtain a copy of the game again. Skyworks is no longer in business and even if they were, they do not own the rights to the game. You would have to get the update of the game from Cartoon Network. Though I have a copy of the game on my flash drive, I do not know if I were to send it to you, if it would work on your computer. Well, my email is victorgeorgiev1911@gmail.com, so I suppose you could try sending it to me. 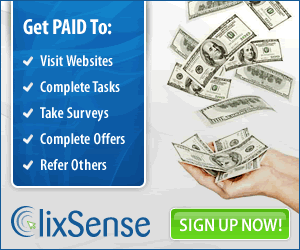 I will see if I can send it to your email. Hey robert, first, thanks for participating in making this game, it’s awesome! I remember playing the demo version many years ago on the CN website. Do you mind to send me this game to my email? -Greetings from Russia megas fans! The one I have is a non production game. It probably would not run on your computer without proprietary software which I cannot share with anyone. But cant u convert it or do something?? Sorry for commenting alot above.cant u send me it even though i wont be able to run it without the appropriate software. I cannot give it to you. Besides the game I have is coded to run with a proprietary piece of software which I cannot give to anyone. Since you cannot run the game without that software and I cannot give the software to you, it makes no sense to give it to you if I could.